Treat your significant other with flowers this Valentine’s Day! 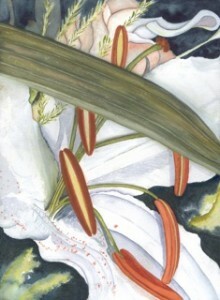 Barnett Fine Art offers several beautiful flower paintings by the talented Joan Hooper Feibelman. A bouquet of flowers only lasts so long; by giving the gift of fine art, your gift lasts a lifetime! 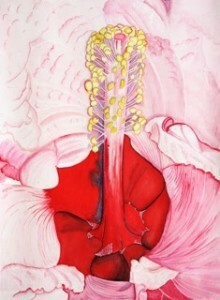 Take a look at Barnett Fine Art’s collection of unique flower paintings to find one that is right for you. “Hidden Lily” depicts a pure white lily hiding behind a leaf. The sweet coyness of this original watercolor captures the tenderness of a budding relationship. This flower painting captures all the emotions of new beginnings and giddy romance. If you have your eye on someone special, presenting them with this delicate watercolor can elegantly capture the demure shyness of a couple in love. Not only are you investing in a skilled new artist, but you are also investing in a symbol of your early relationship that you can look back on for years to come. “Heart Throb” by Joan Hooper Feibelman is a striking work with vivid colors and fine attention to detail. Everything from the smoothness of the petals to the alertness of the pollen stalks creates an aura of tension that is reminiscent of the butterflies one feels when approaching a new love. If you have a new love in your life, or if you just want to revitalize the nostalgic feelings of early romance, then this original watercolor would make a great gift for your loved one. “Heart on Fire” is a vivacious painting that almost bursts from the paper with color and energy. The elongated curves of this blooming lily creates a fluid motion that reminds the viewer of the rollercoaster of ups and downs in any exciting and healthy relationship. 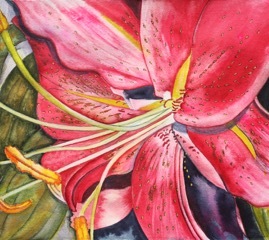 The fiery pink adds an intensity to the composition. Altogether, this original watercolor works well to represent the speed and intensity of two people who have fallen head over heels in love with each other. We’re looking for a good home for this evocative painting by a promising new artist. Also, Mardi Gras is on February 9th! From Barnett Fine Art, have a happy Mardi Gras! This entry was posted on Friday, February 5th, 2016	at 1:49 pm	and is filed under Local Art	. Both comments and pings are currently closed.